The Apple III went down as a costly and embarrassing failure. 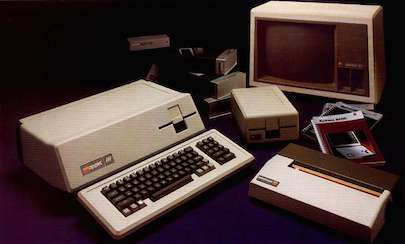 It tarnished Apple’s image and contributed to lose a good chunk of the precious market lead the Cupertino company had conquered with the Apple II. Announced in May 1980, but made available only several months later, the Apple III was sold at prices ranging from 4000 to 7000 USD, depending on the configuration. It was a professional machine partially compatible with the Apple II, an 8 bit computer also powered by the same 6502 CPU, but with a higher clock. It also had more RAM, a higher screen resolution, built-in disk drives and a keyboard featuring upper and lowercase keys and a numeric keypad. The often quoted story about the Apple III goes that it was a failure because of Steve Jobs’ unreasonable demands, most of all his dislike for fans, whose addition he forbade. This design choice supposedly caused such overheating and malfunctions that Apple was forced to replace 14000 units, even after having users perform odd procedures to try and fix the computer.